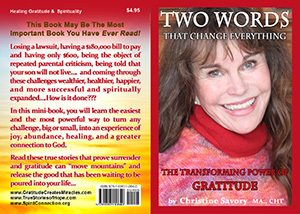 Download the eBook of Two Words That Change Everything for free! Medical experts now agree that over 95% of all illnesses are caused or exacerbated by stress. In addition, stress contributes to high blood pressure, poor immune function, addictive behaviors, low energy, depression, anger, violent outbursts, spiritual disconnection, family discord, overweight problems, depression, loneliness, and feelings of “what’s the use”…. If you are suffering from any of these issues, and wish to experience freedom from these health-destroying problems quickly and with ease, schedule an appointment. As a certified hypnotherapist of 15 years, and a practicing energy healer of 30 years, I have perfected healing techniques that can help you reduce stress hormones, reduce mental stress, facilitate healing on all levels, and assist you to experience spiritual rejuvenation. I can help you overcome addictions, reduce anxiety, transform depression into a optimistic view of your future, and uncover the hidden (unconscious) causes of the problems you are dealing with. In my sessions, there is no need to re-experience trauma as is common with the traditional psychotherapist methods. As a life coach, I can help you see that you have all the power needed to transform your life into one of success, and give you tools to do so. I can show you how to become pro-active in creating a more fulfilling life, the life that you feel is beyond your reach. As an ERT (Emotional Release Technique) practitioner, I can facilitate healing by helping you transform the destructive energy patterns in your body that have been the source of your problems, and free you to experience health and joy as a result of reducing mental stress, reducing stress hormones, and experiencing the freedom of mental, physical and spiritual rejuvenation. Healing is your choice. Let me help facilitate your healing in a relaxed, caring atmosphere. Christian Savory offers the services of: non-demnominational counseling, prayer counseling, Christian Counseling and Faith Based Counseling in Medford, Oregon.